(Boston) Of Mice and Men is a play about alienation, the ways in which people are isolated from society and why. Clever but mean George (Phil Tayler) and his slow friend, Lennie (Harry McEnerny), go from one ranch to the next in 1930’s California. The pair look for work in order to fund their dream of owning a small farm. Excellent chemistry between Tayler and McEnerny emphasizes that their characters have no one in the world to rely on besides each other. They are not the best model for a friendship, Lennie being hopeless dependent on George and George often verbally abusive. To each other, though, they are the world. Most of the central characters seem adrift. Candy (Ed Peed), the handyman, is a soft- spoken, elderly soul with few people to give him the time of day besides his aging dog. There’s also Crooks (Calvin Braxton), a black man left bitter and disheartened with no one willing to keep him company among the white ranch hands. Braxton’s keen awareness of his situation is moving and painful to watch. Even Curley’s wife (Erica Spyres), whose character could have been a wily temptress and nothing more, suffers from isolation. Spyres plays Curley’s wife not as a fool but as a lonely young woman, suffering from a sudden and ill-advised marriage to Curley (Glen Moore). She defends herself against George when he accuses her of being a “tart,” insisting she is a good woman from a good family. Spyres only wishes to be friendly rather than flirtatious. It’s tough on a ranch where anyone who’s different is either the source of ridicule or suspicion. McEnerny’s Lennie Small inspires his fair share of both. Clever lighting by Jeffrey E. Salzberg and Courtney Nelson’s set design paint a bleak, Depression Era ranch. This California is a cruel one. 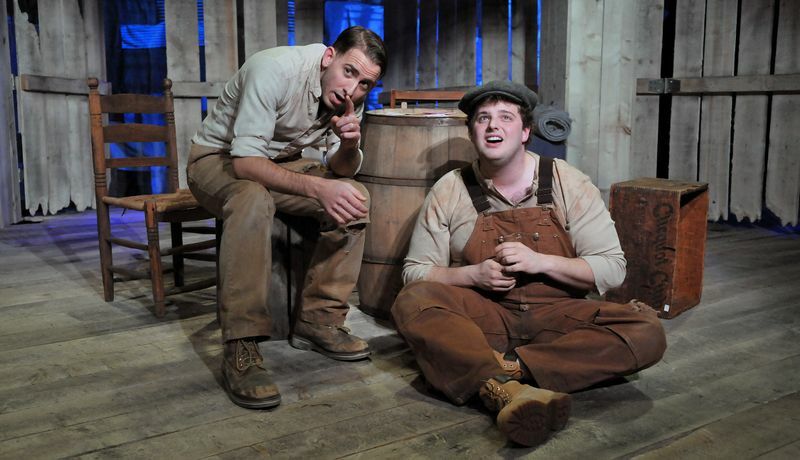 Of Mice and Men is not a joyful romp, where men can be men, but a somber depiction of solitude. The unifying theme may be loneliness, but the heart of director Allison Choat’s production is the friendship of Lennie and George. Phil Tayler’s George is not an educated man much less a perfect one. He barely suppresses his rage from scene to scene. The attitude of Tayler’s character is almost as poisonous as Glen Moore’s antagonist, Curley. George redeems himself only in his loyalty to a widely misunderstood friend. Harry McEnerny, meanwhile, plays Lennie as a good-natured brute. His portrayal of a mentally challenged man is careful and nuanced. The tragedy is not just in how others see him, really, but in how McEnerny’s character has grown up with no one to teach him to control his strength. At least, without George, Lennie is aware he would be hopelessly alone. Under Choat’s sure direction, George must learn the very same thing by the end of Steinbeck’s classic play. This entry was posted in Drama and tagged 1930’s, Allison Choat, Boston, Calderwood Pavilion at the BCA, California, Calvin Braxton, Courtney Nelson, Depression Era, Ed Peed, Erica Spyres, Glen Moore, Harry McEnerny, Jeffrey E. Salzberg, Of Mice and Men, Phil Tayler, Steinbeck by gilliandaniels. Bookmark the permalink.